FROM the middle of January to the middle of February, the shooting star tree (Clerodendrum quadriloculare) puts on its magnificent display that resembles an explosion of fireworks. A shooting star tree in full bloom is one of the most magnificent of all plants. Alas, like many real firework shows, the display is all too brief. Security guards armed with torches and chicken wire are keeping 24-hour watch to stop hedgehogs hiding in a bonfire at one of the country’s largest fireworks displays. The tactic at the Three Counties Showground in Malvern, Worcestershire, is part of a campaign to raise awareness of the danger bonfires pose to hedgehogs. The British Hedgehog Preservation Society (BHPS) has teamed up with cleaning company Spontex, whose mascot is Ernie Hedgehog, to promote the campaign. Clifford Soper, from Spontex, will spend tonight keeping watch to make sure hedgehogs stay away. He said: “A bonfire looks like a five-star hotel to a hedgehog searching for the perfect place to hibernate. “Most people don’t think about checking a bonfire, or better still rebuilding it, before lighting which can result in the death of all sorts of unsuspecting wildlife asleep inside. The Halloween bonfire and fireworks display will take place at the showground tomorrow night. 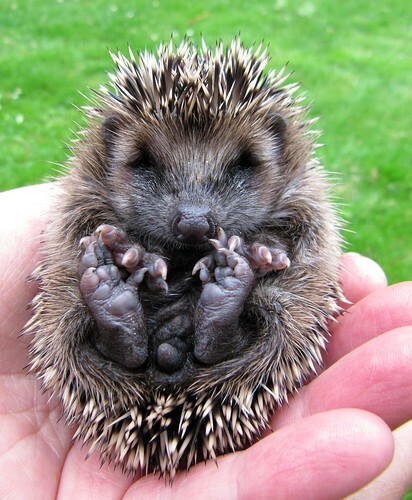 So, if that was not enough to encourage you to check your bonfire, here is a picture of a baby hedgehog in someone’s hand. Do not deny the cuteness. Save the Hedgehogs! Failing that, next week we will publish a great recipe for a roasted hedgehog with Garlic Sauce (kidding).